The perfect present for buds and dormroom inhabitors, this collection of viral fake fliers is at once strange, thought-provoking, and hilarious. 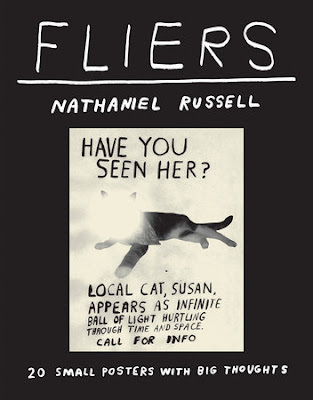 Printed on heavy, cardstock-like paper, these 20 "fake" fliers both celebrate and embody surreal posters--like the kind plastered all over college campuses, only taken to the next level. A final note, there is a silly surprise under the dust jacket. Once I realized what it was it made me giggle. If you interest in Fliers or the interesting artwork you can check out Russell's website for info on his latest work. Even check out some more fake fliers.